Trade allows you to exchange resources with other players. You can trade resources in the Market. Free trade is when you send resources to another village without receiving anything in return. With the exception of sending resources to your own villages, you may be limited from doing this for a set period of time after you join a world. If you are currently restricted from using free trade, an error message will be shown when you try, along with the date and time at which you can send resources. 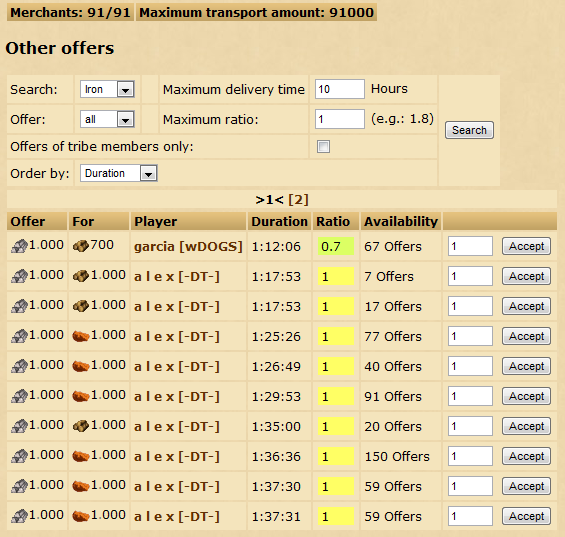 One merchant can transport a maximum of 1000 resources. This could be 1000 of one resource, or split up between different resources in any way. For example, one merchant could carry 100 wood, 350 clay and 550 iron. When you increase the size of your market you will receive more merchants. This means you will be able to transport more resources at the same time. When you want to trade resources with someone you don't know you should create an offer on the market instead of using the free trade system. This ensure that both sides of the trade receive exactly what they asked for. The offers system allows you to either create your own predefined offers that other players can accept, or accept offers that others have already made. When you accept an offer, or someone else accepts your own offer, the resources are sent automatically. To create an offer go to the market and click on own offers. From this screen you can create as many offers as you wish. It can be a good idea to split a very large offer into many smaller ones so more players can accept them. To accept another player's offer click on other offers. You can also filter the results depending on what resource you are looking for and the maximum duration. An example of the other offers page in the Market. 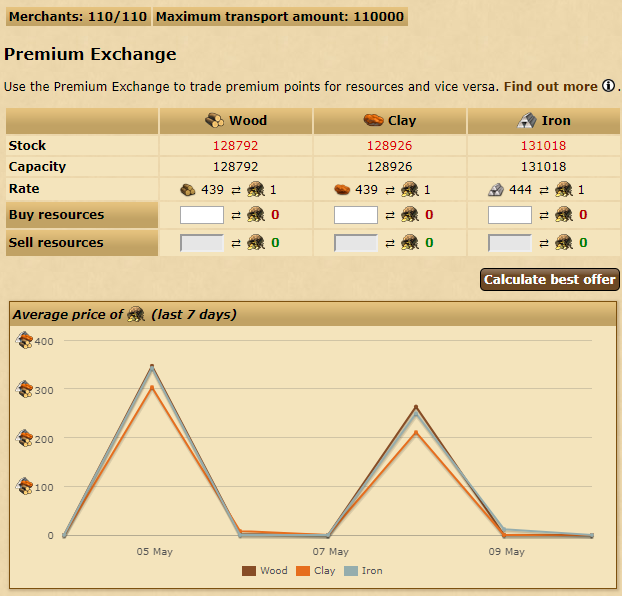 Use the Premium Exchange to trade premium points for resources and vice versa. This feature replaces the older method of creating trades in the marketplace and the exchange has its very own tab! There is one Premium Exchange for every continent. Every Exchange has its own capacity, indicating how many resources of each type it can hold. An Exchange's current stock and its capacity will determine the current rate for trading. Resources are traded at lower rates when the stock is full and the other way around. When an Exchange's stock is full, no more resources of that type may be sold to it. When an exchange's stock is empty, no more resources of that type can be bought from it. You can enter trade orders into the "Buy" and "Sell" fields and see an estimate of how much they are worth, based on the resources' current rates. When you place an order, the Exchange will suggest a trade to you, with matched values rounded up to the nearest full premium point. When you accept this offer, the resources will be transferred between you and the Exchange. Selling resources to the Exchange will require your village's merchants to ship the resources, while buying resources will use the Exchange's merchants. In both cases the delivery time will be 2:00:00. Please note that the premium points obtained that way won't be transferable for 60 days. When buying resources from the Exchange, a small portion of the proceeds will be put aside automatically to increase its capacity for the traded resource. Each day, Exchanges on adjacent continents will also shift around capacity and stock to mitigate differences in their trading rates. This page was last modified on 11 May 2018, at 22:31.